Widyono is highly critical of UNTAC’s performance, accusing it of “shaping and perpetuating the Cambodian tragedy” (ibid., p. xxvii). Problems brought by UNTAC onto itself include its slow deployment; a crippling lack of Khmer-language speakers in most of its components (ibid., p. 18); and the shameless flaunting of wealth and lack of discipline among UNTAC’s peacekeepers. This last problem generated xenophobic anti-UNTAC sentiment among Cambodians, triggering violence and other security problems (ibid., pp. 100-101). Structurally, UNTAC’s Civil Administration component failed to exert control over the SOC government. Widyono notes that this failure was inevitable given the fact that UNTAC’s Civil Administration was only allocated 200 officers to control the SOC government’s 200,000 (ibid., p. 59). 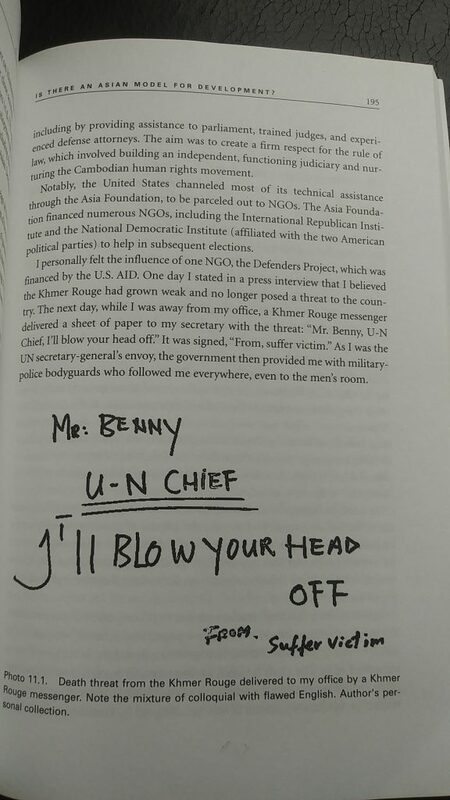 More seriously, Widyono observes that UNTAC coddled the Khmer Rouge, and this leniency emboldened the Khmer Rouge’s resistance. Having identified UNTAC’s weakness of will, the Khmer Rouge refused to lay down its arms, leading to the collapse of the demobilization of Cambodia’s factional armies (ibid., pp. 77-78). One important consequence of this, Widyono notes, emerged 5 years later on 5 July 1997, when a bloody battle erupted between the (un-demobilized) armed militias of! 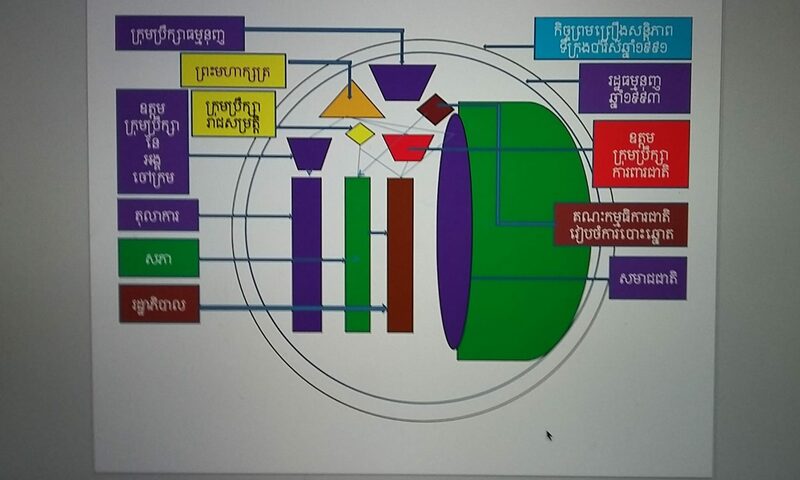 Hun Sen’s Cambodian People’s Party (CPP) and Prince Norodom Ranariddh’s Front Uni National Pour un Cambodge, Independent, Neutre, Pacifique et Cooperatif (FUNCINPEC) (ibid., pp. 253-254). As the 1993 elections neared, the Khmer Rouge tried to disrupt the electoral process with military attacks on UNTAC. Its military resistance caused UNTAC great difficulty. Under the Paris Agreements, the SOC army was supposed to be demobilized, and hence was not legally obliged to protect UNTAC (ibid., p. 106) from the Khmer Rouge. The Khmer Rouge also continued with its program of ethnic cleansing, massacring 124 Vietnamese civilians in Siem Reap’s Chong Kneas floating village on March 10, 1993. This massacre succeeded in forcing 21,000 Vietnamese, including second and third generation residents of Cambodia, to flee to Vietnam. Widyono notes Sihanouk’s and UNTAC’s shameful indifference to the plight of Cambodia’s Vietnamese residents (ibid., pp. 96-98). Despite the massive international involvement, the 1993 elections would prove meaningless. Even though FUNCINPEC won, CPP pressure led Sihanouk to declare a power-sharing government, with Hun Sen and Ranariddh as co-premiers, and the CPP having more seats in the cabinet (ibid., pp. 129-131). During this post-UNTAC period, Widyono returned to Cambodia as the UN Secretary-General’s Political Representative to the Royal Government. From this vantage point, Widyono observed the strengthening of the CPP’s hegemony and the corresponding failure of FUNCINPEC to subvert the CPP’s extensive patronage networks. Hun Sen later confided in Widyono that the CPP had been successfully modeled after the hegemonic organization of Indonesia’s GOLKAR and Malaysia’s UMNO political parties (ibid., pp. 146-147). 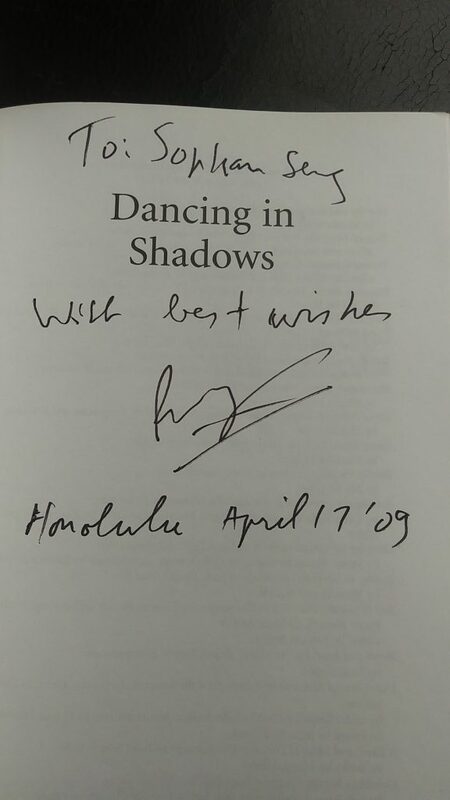 Also of interest in Dancing in Shadows are Widyono’s personal observations of Hun Sen, Sihanouk and Ranariddh. ! Hun Sen emerges as a remarkably determined individual who used his leadership skills and abilities to build a loyal and effective patronage network unparalleled in Cambodia. 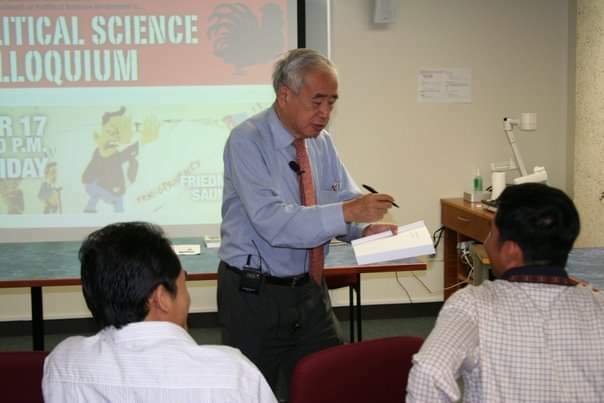 Ranariddh’s corresponding lack of effective leadership skills, coupled with his delusions of grandeur, would exacerbate the fury of the FUNCINPEC rank-and-file when he failed to adequately reward them for their support (ibid., p.128 EXPLORATIONS a graduate student journal of southeast asian studie 216). His failure to reward past loyalty would trigger a crippling tide of FUNCINPEC defections to the CPP. 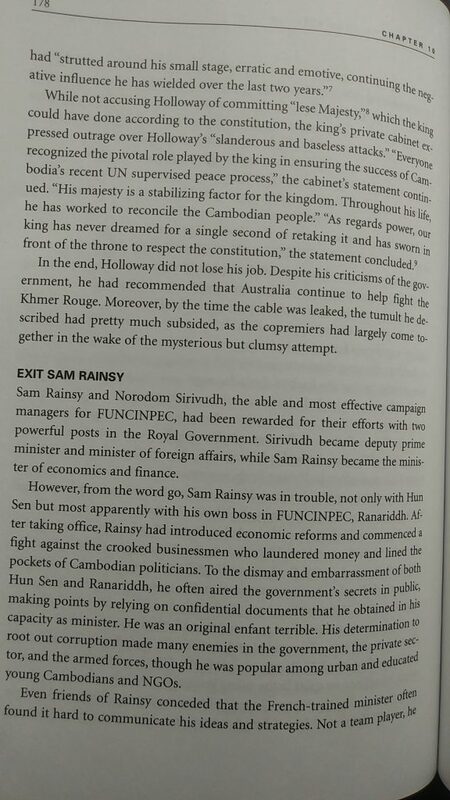 In addition, even though Ranariddh was nominally the First Prime Minister, he was happy to let Second Prime Minister Hun Sen handle the drudgery of actual government leadership (ibid., p. 154). 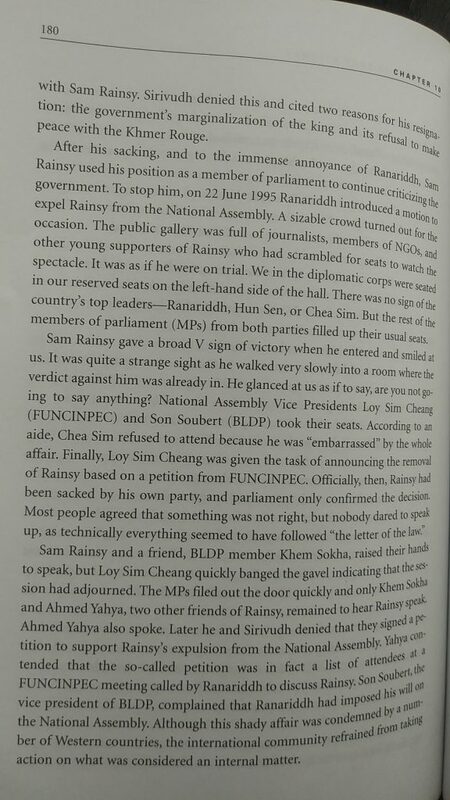 Ranarridh’s inaction directly strengthened Hun Sen’s grip on power, and eventually led him to be eclipsed by opposition leader Sam Rainsy. Overseeing all this was the increasingly impotent King!Sihanouk, filled on one hand with resentment against Hun Sen and Ranariddh, and on the other with grudging admiration at Hun Sen’s skillfulness in outmaneuvering himself and his son (ibid., pp. 160-161). As noted earlier, in 1997 the tensions between the CPP and FUNCINPEC exploded in a military confrontation between their militias. Widyono, who had since retired from the UN, interprets the battle as having been planned by both sides. Given the documentary evidence, FUNCINPEC was probably planning a coup d’etat as alleged by the CPP; but the CPP itself had clearly planned its attack on FUNCINPEC, and hadn’t been taken by surprise as claimed (ibid., pp. 256-258). Interestingly, Ranariddh’s subsequent pardon and return from exile illustrates the curious circulation of personalities on Cambodia’s political stage. Widyono cites the assassinated FUNCINPEC MP Om Rasdy’s analogy: “Cambodia resembled a play that lacked enough actors. 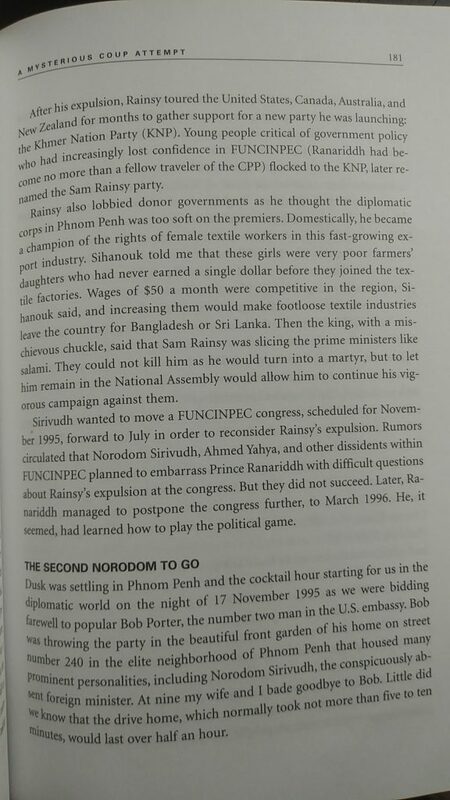 Consequently, each of the main players had to assume many roles.” (ibid., p. 147) Over the next decade, Ranariddh and Sam Rainsy would periodically find themselves exiled and pardoned; Hun Sen would remain at the apex of power, and Sihanouk would slowly but noisily fade from the stage, eventually abdicating in favor of the apolitical Prince Sihamoni (ibid., p. 279). Upon his return to Cambodia for a visit in January 2005, Widyono observed the fruits of the country’s welcome economic growth. After the final defeat of the Khmer Rouge, Siem Reap experienced a massive tourism boom, leading to wealth for local entrepreneurs. However this economic boom also directly led to an expansion of the patronage system: for example, almost all the new hotels were owned by CPP cadres. Phnom Penh experienced a similar economic boom: new commercial activity can seen in the establishment of private universities, luxury hotels and restaurants, shops selling pirated CDs and DVDs, and drivers offering rides on tuk tuks and motos. However, the economic boom in urban Cambodia has to be contrasted with the continued poverty of rural Cambodia. The plight of the Cambodian underclass has been exacerbated by the property boom, for rising property values have led to predatory land grabbing across Cambodia. Hun Sen’s angry denunciations against the CPP cadres responsible for land grabbing have yet to stop the problem (ibid., pp. 284-286). Dancing in Shadows would indeed have been improved with an analysis of these other personalities in Cambodia’s constellation of political players. 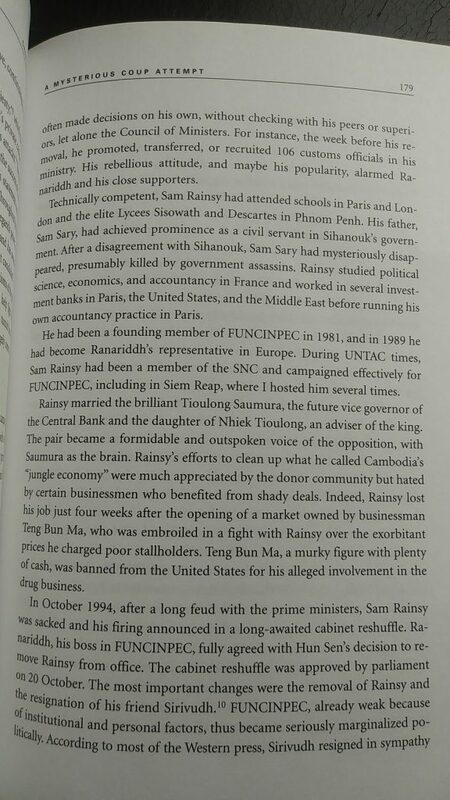 Widyono offers occasional tantalizing hints of his encounters with these personages, and in his administrative and diplomatic capacity he would certainly have an insider’s knowledge of their roles in Cambodia’s networks of power relations. An understanding of this constellation of personalities is particularly urgent given the alleged involvement of high-powered individuals in problems ranging from corruption to land grabbing. 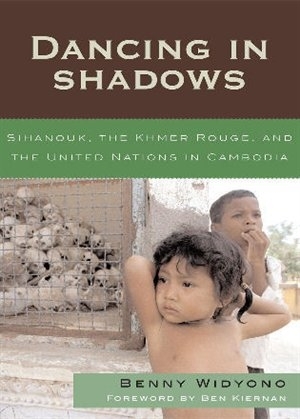 Being a political memoir written in engaging prose, Dancing in Shadows offers an insider’s view into a critical moment in Cambodia’s recent tumultuous history. As such, it is an invaluable resource for all interested observers and students of Cambodia, undergraduate and graduate alike.